I was looking through the wood pile today trying to gather scrap pieces to frame out some rough cut pine for a small mosaic. 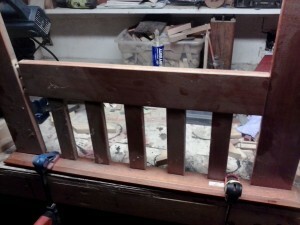 I found barrel staves and slats, but the slats were too thin and the staves too curved.Then I remembered the old futon. I have had a wooden futon frame, and a collection of assorted futon pieces, waiting for the right project for almost 6 years. I have used pieces of this futon in a mosaic, as table legs, shelf slats ,and as cleats to hang shelves. I had busted up the large pieces a while ago but in my scavenging I discovered that I had an entire arm left over that needed to be taken apart. It had some nail holes, but no structural damage and it looked like it would be the perfect size for my frame. I gathered the tools needed to take its apart and started the destruction, which was much more of a hassle than I intended. 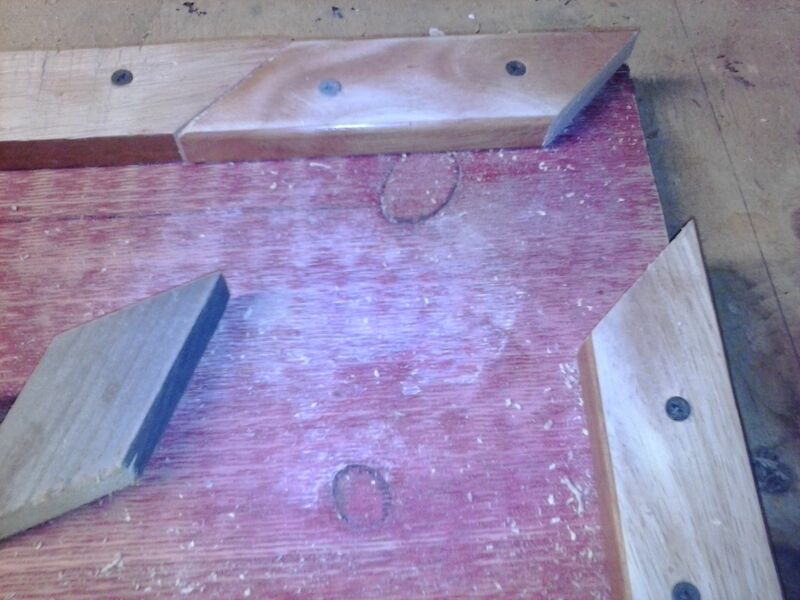 The first challenge was to disassemble the arm without damaging too much of the wood.. I needed about 36 inches for my frame.. Normally with futon slats I hit them out with a mallet and let things fall or use a reciprocating saw but I needed almost every piece of this to come apart intact so I had to be very careful.. This futon was not any where near a top pf the line model, but it was held together well with a combination of adhesives, brads, clevis pins, dowels, and barrel bolts. To remove the arm slats I clamped one side of the arm down on the bench and used a tamping block and a mallet to gently tap a piece free. I carefully removed any nails or bolts and continued. Sometimes the mallet worked without any other tools, but sometimes the slats came out with a portion of a dowel still attached. If that happened I would clamp the piece down and use a flat saw and make a flush cut. After applying the mallet and cutting I had a stack of wood instead of a futon arm. Closer to end product but not yet what i needed for my mosaic frame. The pieces were not the same thickness, they were close but not close enough. I will sometimes leave small differences in thickness alone. it adds character and communicates that this is a one of a kind hand made piece. I don’t have a thickness planer so there is not a lot I can do to correct thickness differences but if the two boards are more than 1/4″ off I will go over them a few times with some specialty tools. I line up a piece of wood that is the correct thickness with the board that is too big. I mark the side of the board in several places to use as a guide for material removal. 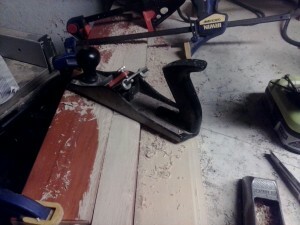 If I am removing more than 1/2″ of material I will also use a nice sharp chisel. After I draw my mark it’s pretty simple, I use a rasp, a hand plane and a finish sander until I can no longer see my line. I make sure it’s level, or at least close to level and that’s that. It doesn’t take too long and it serves two purposes. First, it adjusts the thickness so things are more uniform. Second it removes the existing finish. The old surface is hard to paint, or glue, but once it is removed it makes it much much easier to stain it, paint it or use adhesives. 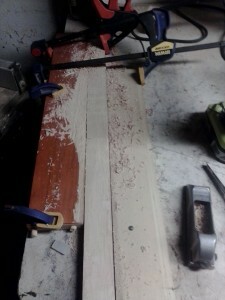 The final stage is to cut the pieces down to size. I used my miter saw to cut the angles. I have a miter box for my hand saw and I have a power saw. I used both saws for this project. After all that work I ended up having 3 inches less material than I needed for my frame At that point I had a few options. I could cut my substrate to fit my frame pieces. 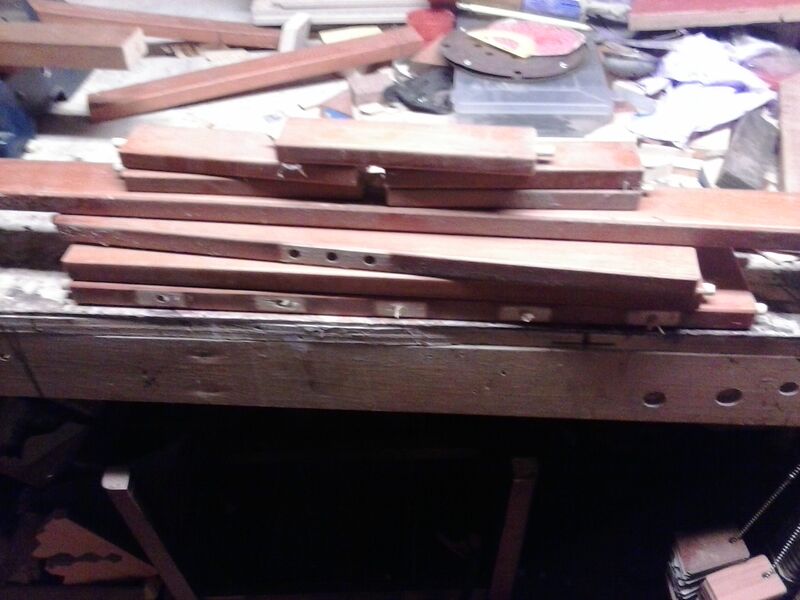 I could look through my scrap pile in the hopes of finding a piece to fit? I could leave everything as is and somehow incorporate the missing frame segments into my design. 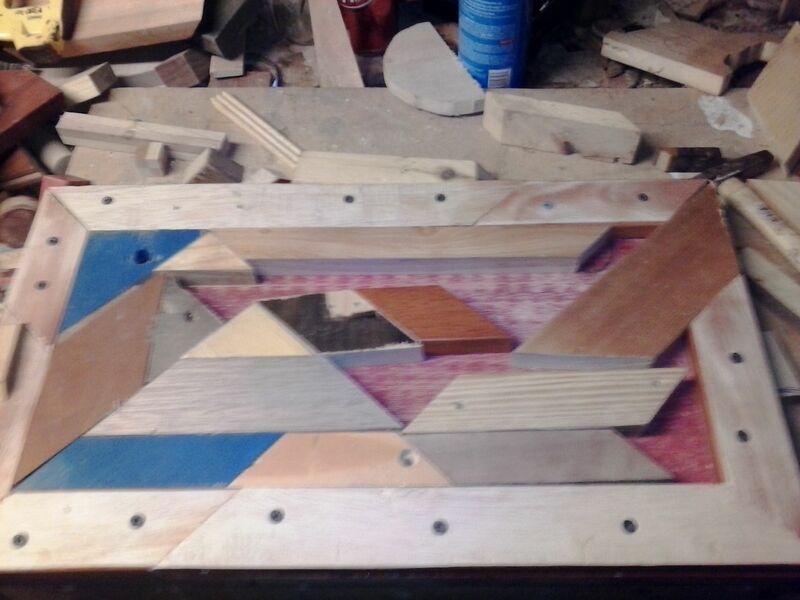 I could save these pieces for another project and start cutting again, this time measuring the perimeter a third time to ensure that I have the proper amount of material. So many options! I dry fit most of them, and a few others actually but I decided to incorporate the missing piece into the design and run a mosaic to the edge of the substrate. I still have a few more pieces to cut before the last mock up and final assembly. Now I just have to decide if I am going to make this into a mosaic wall hanging or another plant stand? I really like the plant stand idea because I really like the idea of functional art. unfortunately my end tables and hall tables are hard to ship but because it consists of a base, t pedestal and a top it is relatively easy to sell online. I like my wall art but my first love will be my tables. This entry was posted in process, repurposeing, scrap wood, wood working by brighid. Bookmark the permalink.